Today I’m taking a look at my newest HTPC addition, the Lenovo Multimedia Remote with Keyboard. This device is gaining popularity very quickly due to it’s usefulness and it’s competitive price. 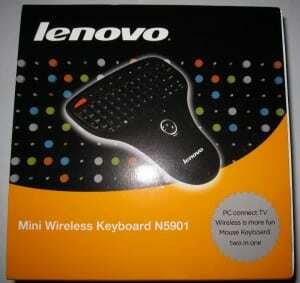 The keyboard is a 2.4ghz wireless device, using it’s own proprietary “nano” sized dongle. This dongle fits in a slot under the battery cover so you can take it with you for presentations or on the go and not worry about losing it. Other users have reported that each remote is coded to it’s own dongle, so multiple devices can be used in one household as well. The remote runs on 2 AAA batteries and a set is included. It comes very well packaged in a nice box. Below the multimedia keys is a compact QWERTY keyboard including Fn keys as well as shift, Ctrl, Alt, the Windows key, the “menu” key, a full set of arrows, backspace, Del, Enter, Caps Lock, Tab and Escape. There is a large PGUP and PGDN on the left side that are also HOME and END when Fn is used. Another well thought out extra is a CTRL-ALT-DEL when Fn and Enter are pushed together. Operating the keyboard is not difficult, but may be an adjustment for some users. 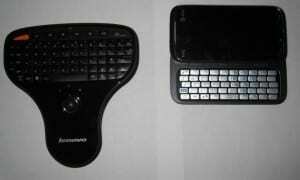 I found it took some getting used to because the layout is slightly different than my Tilt2 smartphone’s keyboard. I suspect that if you don’t have a QWERTY device you wouldn’t notice as you’d learn this layout from the start. I find it misses keypresses occasionally, but not much more than the wireless keyboard it replaces. Below the keyboard is an optical trackball with two butons. I found the trackball to be decent, but not stellar. The mouse buttons also take a little getting used to and I had to use the same finger to run the trackball and push the mouse buttons. Despite the page up and down buttons and arrows I do kind of wish they had incorporated a “scroll wheel” of some sort into the remote. 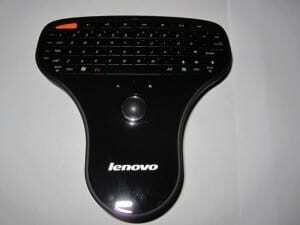 Range is excellent, my Microsoft Wireless Comfort Keyboard can work intermittently even from my couch. 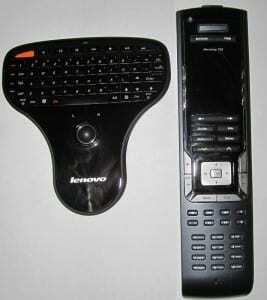 The Lenovo remote worked well at the furthest distance I could get from the TV and still see it, 30′. This is consistent with Lenovo’s claim of 10 meters for the range, it’s refreshing to see a device that lives up to it’s range claims as this is a frequently exaggerated number. My HTPC is sitting in the open so your performance may vary particularly if your PC is in an enclosed space. 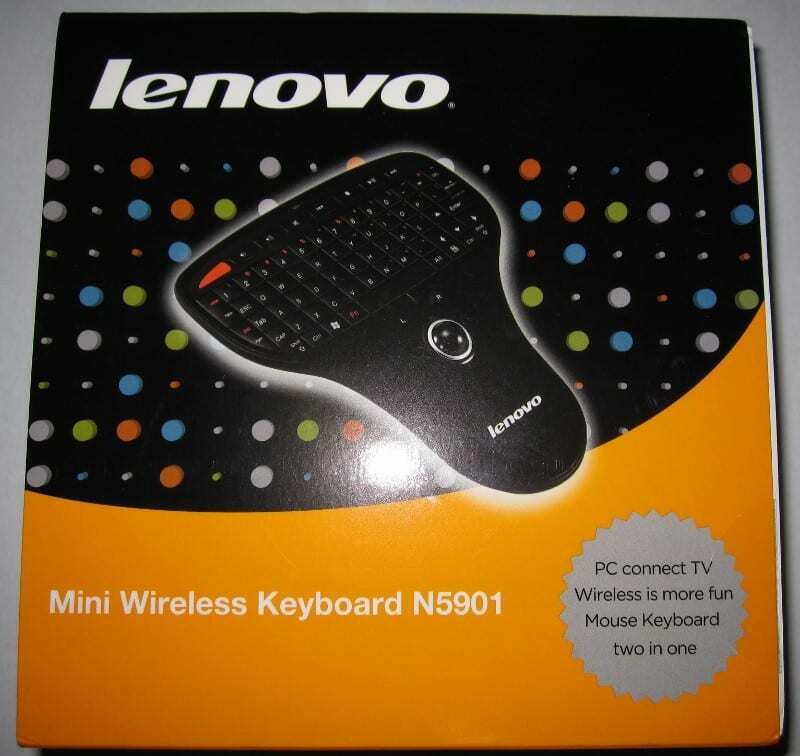 I haven’t compared this to what is probably the most popular device in the segment, the DiNovo Mini from Logitech. I can tell you though that the MSRP of 59.99 is less than half the MSRP of 149.99 of the DiNovo. The DiNovo also rarely sells for less than 120 dollars, where the Lenovo has already been on sale several times in the 30-40 dollar range. 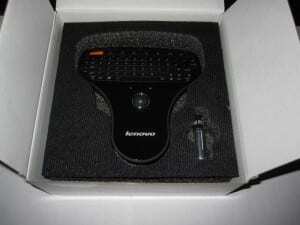 I find it hard to believe that the DiNovo offers 3x the value of this device. However that does bring me to the one disadvantage this device has versus the Mini; no backlit keys. That may be the DiNovo Mini’s biggest advantage over this device. If you’re interested in checking this device out you can see it on Lenovo’s Website. You may want to keep an eye on deal websites like Slickdeals.net as this item frequently goes on sale with a coupon code that is posted on those sites. Next Article 3 Step Guide To Overclock Your Core i3, i5, or i7 - Updated! Great review. Hope I can find it in the UK. I was very excited when I saw the deal posted on Giz. Finally going to get my HDTV hooked up to my computer. I ordered one right away when I saw the deal (March 4th). I then looked the next morning as to my order status: In process. Today the status is the same. No tracking number, no estimated ship date. As I followed an external link to the product - i had missed where on their keyboards page, most accessories (keyboards, mice, joysticks) list as taking 9+ days to ship. Perhaps they do not stock their own items? Looking through their own forums, shipping delays seem to be the norm. I followed a link on the status page explaining estimated ship dates and it states up to 10 days for build / configuration but that does not apply to accessories. I'm baffled and will start going through the process of trying to figure out why they have such a hard time shipping products in a timely manner, but have no issue billing you immediately. Perhaps the company as a whole is having cash flow issues? Anyone else have any insights from personal Lenovo experiences? Well I got the remote today - had shipped 2 days after I ordered it but the order status still shows no shipping date. The device itself is nifty. Ive decided i will finish this post with it. The trackball is a little loose and overly sensitive. Selecting text or clicking small buttons is very difficult. Almost impossible when done one handed. However it seems to do its job of finding and playing netflix movies in a nightstand friendly package. 3/22/10 - I finally received my shipment notification in the inbox today - a full 12 days after receiving the product. Just something to keep in mind when ordering from these folks that when you order something it seems that you have NO way of knowing the status of your order and if there is a problem good luck getting a timely response. Fortunately everything worked out for me - but I have yet to get a reply to my order inquiry email i sent out weeks ago. Thanks for the Review. Yours is the only one I could find. Thanks. (bought with deal for $35 plus tax but free shipping). Excellent review. What is even more weird is the fact you have the 720 remote as well. I am beginning to think your a slickdeals junkie like me cause I used SD to buy my 720 and my Lenovo and various other stuff. 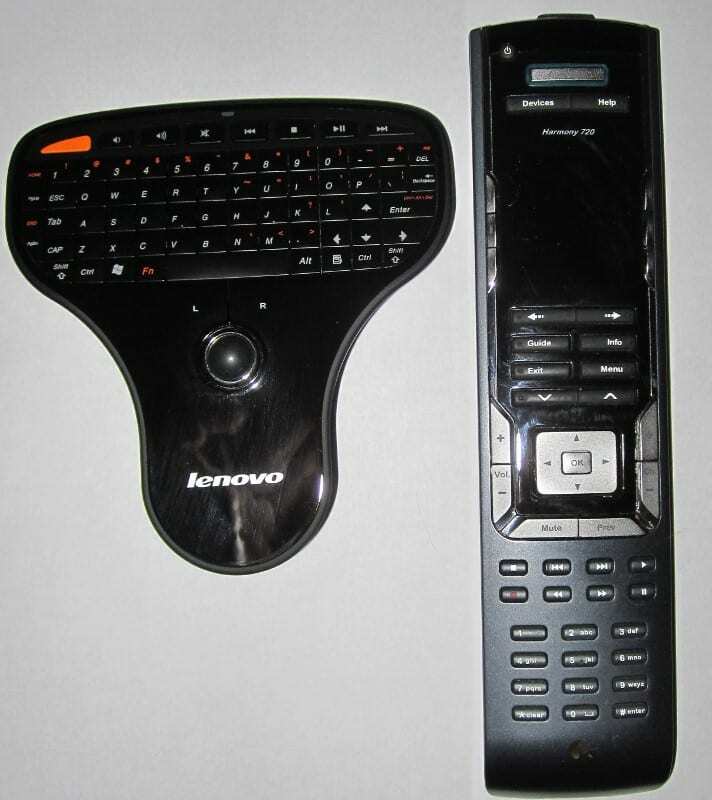 I am in fact a SD junkie, I'm also going to revise the article as Lenovo has changed the design of the remote slightly, the newer "holiday skins" versions that were on sale around the first of the year had a dedicated CTRL-ALT-DEL button among other things that were tweaked, the keyboard portion was more consistent in keypresses as well. IMOG posted my review of the DiNovo mini today as well if you're interested in a comparison to one popular remote, we're working on getting some samples of other devices as well such as the Rii and I know IMOG has a device from nMediaPC coming up.